[center][permalink][img]http://flightrising.com/dropbox/tabsfordays.png[/img][/permalink][/center] It's here! The long-awaited [b]Lair Revamp[/b] is now live. Organize your clan using custom [b]tabs[/b] and [b]pages[/b] and place some of your favorites within the [b]Hibernal Den[/b], a brand new [b]optional, cosmetic storage space[/b] where dragons won't lose energy! [center][permalink][b]Click here to read more about this update. [/b][/permalink][/center] [more] ------------ [size=5][b]Lair Revamp[/b][/size] The lair revamp is complete and now live across all player accounts! [i](If you haven’t yet, open a new tab and take a peek at your lair! )[/i] This revamp allows all players to customize their dragon lair with a number of [b]new organizational options[/b]: [LIST][*]Dragons can now be placed on different [b]tabs[/b]. [*]Dragons can now be placed on specific [b]pages[/b] within [b]tabs[/b]. [*]Tabs can be designated with custom [b]names[/b] and [b]icons[/b]. [*]Tabs and pages (and thus entire groups of dragons) can easily be [b]moved around[/b] to create your ideal layout. [*]It is now possible to designate whether [b]4[b] or [b]5[/b] dragons appear [b]per row[/b]. [*]Dragons can be moved to the [b]Hibernal Den[/b], where they [b]don't lose energy[/b] in exchange for not being able to interact with other site features (such as breeding, familiar bonding, or dominance). [/LIST] [I](A quick note: If a part of this walkthrough seems familiar to you, much of this information was stated in our [url=http://www1.flightrising.com/forums/ann/2556860][b]Dev Update[/b][/url] last October, but we weren't able to share several details with you at the time! )[/I] [size=4][b]Edit Mode[/b][/size] To get started, click the [b]gear[/b] icon within your dragon lair. This will take you into the lair’s new [b]Edit Mode[/b]. [center][img]http://flightrising.com/dropbox/prev_editmodebutton_final.png[/img][/center] In Edit Mode, you’ll be able to manage the following things: [list][*][b]Purchasing, naming, and arranging lair tabs. [/b] [*][b]Purchasing additional lair slots[/b] (i.e. expanding your lair to the cap) [*][b]Arranging your dragons[/b][/list] All players have had their current active dragons migrated over to a [b]"main tab"[/b] (denoted by a purple arrow). All of your active dragons are displayed, sorted into [b]tab pages[/b], identical to how the legacy lair displayed them, i.e. 20 dragons per page. You will easily be able to see where [b]page breaks[/b] are as you scroll to view your dragons. [b]While your lair looks different, no changes have been made to your lair's dragon order. [/b] It's the same as it was before the lair revamp was launched. By default, new dragons that you acquire through gameplay (Auction House, Crossroads, hatched eggs, etc.) will be sent to the [b]last page[/b] of the main tab [i](internally, we’ve been calling the main tab the "dragon inbox")[/i]. This tab will always be flagged with a [b]purple arrow icon[/b] so you can find your newest dragons. [center][img]http://flightrising.com/dropbox/prev_maintab_final.png[/img][/center] In addition to the main tab, all accounts have been given [b]one additional tab for free[/b]! This means you can start organizing right away without any investment. If you don’t want to use the tab, leave it empty and it won’t display (to you or others) on your lair when you leave Edit Mode. You can purchase additional lair tabs (up to a total of [b]15[/b] in all) for [b]treasure[/b]. You also have the option to [b]rename[/b] any of the tabs (including the main tab) at any time for no cost, and [b]arrange them[/b] in whatever order you wish. Taking our example above, you could name the main tab "Dragon Inbox", move it to the rightmost spot on your tab layout, and have its only purpose be to handle incoming dragons. Additionally, we’ve dedicated time to ensure the act of arranging your dragons is much easier on mobile devices. Edit Mode was built to [b]recognize your device type[/b]. Moving dragons (whether its with a mouse cursor or your fingers) feels as natural as possible. We also removed a few tooltips from the mobile version so that it's not necessary to click certain buttons more than once just to perform one action. Gone are the days where moving a dragon from page 1 to page 9 was a multi-step process; you can drag that dragon all the way to the bottom of Edit Mode into its new page with one action! You can even [b]collapse pages[/b] you don’t want to move the dragon into, making it far easier to avoid mistakes and resulting in far less scrolling overall. 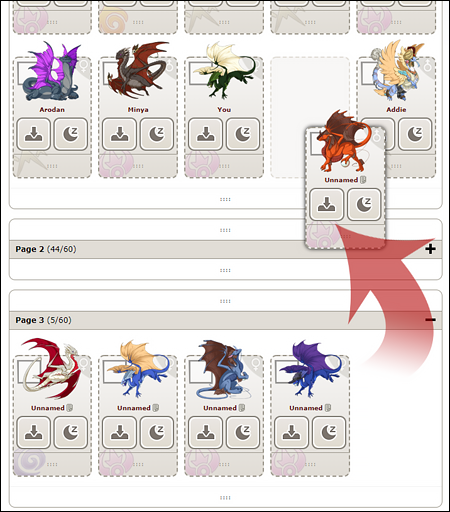 [center][img]http://flightrising.com/dropbox/prev_movefrompage3topage1_final.png[/img][/center] It is also now possible for you to [b]select multiple dragons at once[/b] and either send them to a [b]different tab[/b] or into the [b]Hibernal Den[/b]! [center][img]http://flightrising.com/dropbox/prev_multiselect_final.png[/img][/center] In addition to the tab system, there are now a [b]few more controls[/b] with which to customize your lair: [list][*][b]Dragons Per Page Increased[/b]: In the legacy system, the number of dragons per page was a minimum/maximum of [b]20[/b]. All accounts have been migrated to the new system with their dragons preserved in this format. We have increased the [b]maximum number[/b] of visible dragons per page to [b]60[/b]. This means that if you want to showcase more than 20 dragons on a particular page of the tab you’re working in, you can! What you design within Edit Mode is what other players will see. [/list] [list][*][b]Dragons Per Row[/b]: Based on player feedback, you are now able to set whether or not to display [b]4 or 5[/b] dragons per row. This visual setting can be applied at the tab level. [/list] [center][img]http://flightrising.com/dropbox/prev_4dragonrow_final2.png[/img][/center] [list][*][b]Tab Icons[/b]: If you’d like to customize your dragon lair just a little more, you can also designate an icon for each of your tabs. We have a fairly robust set to start with, and we hope to add more icons over time. [/list] [center][img]http://flightrising.com/dropbox/prev_tabicon_final.png[/img][/center] We’ve also moved [b]lair expansion[/b] information and functions to the top of Edit Mode, rather than at the bottom of the last page of your lair. This will allow you to quickly see, at a glance, [b]how many dragons you currently have[/b], and [b]how many your lair can support. [/b] You can easily expand your lair slots and tabs with the click or tap of a button. [center][img]http://flightrising.com/dropbox/prev_addtabsaddslots_final.png[/img][/center] That’s not all, though! It's also possible to [b]highlight dragons that meet certain criteria[/b] if you’re looking for a specific dragon! Selecting a highlight filter will set all other dragons in the lair to a lower opacity, leaving only the ones who meet specific parameters in plain sight. This filtering system can also be toggled on when viewing your lair outside Edit Mode by clicking the [b]magnifying glass button[/b] before your first tab. [center][img]http://flightrising.com/dropbox/prev_highlightdragons_final.png[/img][/center] ---------- [size=5][b]Hibernal Den[/b][/size] The Hibernal Den acts as an [b]optional secondary cosmetic storage area[/b] for dragons that you love and want to keep around, but don’t necessarily want to interact with the rest of the game’s features and functions. You can jump directly to your Hibernal Den by clicking the following button at the top of your dragon lair. [center][img]http://www1.flightrising.com/static/layout/lair/buttons/mode-den.png[/img][/center] [b]Dragons inside the Hibernal Den do not lose energy or eat from your food stores[/b]. They do, however, have some restrictions: [quote] [i]The following restrictions will apply with regards to [b]moving a dragon to[/b] the Hibernal Den:[/i] [list][*]Dragons [b]cannot[/b] be placed in the Hibernal Den [list][*]if they are tending a nest. [*]if they are listed on the Auction House. [*]if they are part of your active Coliseum team. [*]if they are attached to a pending Crossroads trade. [*]if they have a Hibernation Cooldown. [/list][/list] [i]The following restrictions will apply to dragons that are [b]inside the[/b] Hibernal Den:[/i] [list][*]Dragons in the Hibernal Den [b]cannot[/b] [list][*]lose energy or be fed. [*]breed. [*]bond with their familiars. [*]be traded via Crossroads [b]or[/b] sold via the Auction House. [*]be put on a Coliseum team. [*]be exalted. [/list][/list] [list][*]Dragons in the Hibernal Den [b]can[/b] [list][*]equip/swap familiars. [*]equip apparel & skins. [*]be modified by certain specialty items like breed or gene scrolls. [*]have their biography edited. [/list][/list] [i]The following restrictions will apply with regards to [b]moving a dragon out of[/b] the Hibernal Den:[/i] [list][*]When a dragon is removed from the Hibernal Den, it will receive a "hibernation cooldown" of [b]30[/b] days. It [b]cannot[/b] be placed in a Hibernal Den (be it yours or another player's) again until this duration expires. [*]There will need to be an empty slot for them in the lair. [/list] [/quote] Hibernal Den also has an [b]Edit Mode[/b], complete with [b]tabs[/b] and [b]pages[/b], and you can perform most of the same functions within. There are a few differences. All players start with [b]one (1)[/b] free Hibernal Den [b]tab[/b] (their "main" tab), and [b]five (5)[/b] free Hibernal Den [b]slots[/b] (each slot accommodating one dragon). -------------- [size=5][b]Expanding Your Hibernal Den[/b][/size] Beyond the 5 free slots everyone will get, it's possible to expand the Hibernal Den an additional [b]400 slots[/b] by way of [b]two different methods[/b]: [LIST][*][b]Item Turn-In Tasks[/b]: You will be able to unlock [b]300[/b] total Hibernal Den slots by completing item turn-in tasks. These tasks begin fairly easy and increase in difficulty the further you go, but all items can be obtained through [i]Flight Rising's[/i] various features like [b]Gathering[/b], [b]Marketplace[/b], and the [b]Coliseum[/b]. [/list] [LIST][*][b]Gems[/b]: You will be able to unlock [b]100[/b] total Hibernal Den slots by purchasing them with gems ([emoji=gem] [b]50[/b] each). [/LIST] If you unlock all slots in the Hibernal Den and fully expand your Lair, that's space for a total of [b]605 dragons! [/b] ---------------- A note: The lair revamp’s focus was to improve usability and address player feedback on how the lair works. Revamping the infrastructure for how dragons are organized allowed us to create a foundation for potential improvements, updates, and customization options in the future. Adding additional dragon storage slots to the lair was not a part of this project’s goal. We understand this won't be viewed as a popular decision for some of you, and that you may be feeling discouraged. We also understand that it seems like it would be easy to just tack more lair space on at the same time we deploy the revamp, but to put it simply: it’s not. Adding additional lair space affects small and large lairs in non-uniform ways due to how the energy/hunger mechanic works. We need to allow the addition of the Hibernal Den to have time to breathe before we revisit that discussion internally. So while we don’t have any current plans for additional regular lair space, we are monitoring how the Hibernal Den complements current gameplay styles. We encourage everyone to spend some time with the added capacity for awhile and provide us feedback once things have settled a bit more. --------- Thank you to everyone who provided feedback in the Suggestions forum and developer updates over the years, as those discussions helped shape how this revamp came together in the way that it did. We look forward to seeing all the new and creative ways you'll showcase your dragons! It's here! The long-awaited Lair Revamp is now live. Organize your clan using custom tabs and pages and place some of your favorites within the Hibernal Den, a brand new optional, cosmetic storage space where dragons won't lose energy! Dragons can now be placed on different tabs. Dragons can now be placed on specific pages within tabs. Tabs can be designated with custom names and icons. 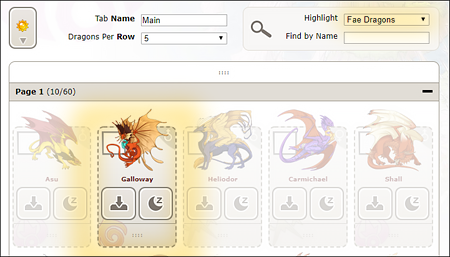 Tabs and pages (and thus entire groups of dragons) can easily be moved around to create your ideal layout. It is now possible to designate whether 4 or 5 dragons appear per row. Dragons can be moved to the Hibernal Den, where they don't lose energy in exchange for not being able to interact with other site features (such as breeding, familiar bonding, or dominance). To get started, click the gear icon within your dragon lair. This will take you into the lair’s new Edit Mode. Purchasing, naming, and arranging lair tabs. 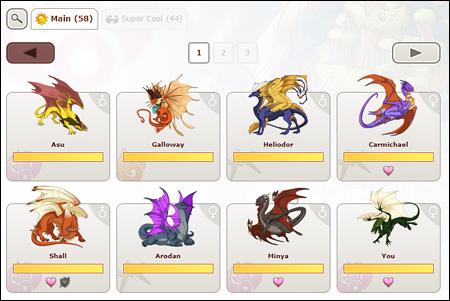 All players have had their current active dragons migrated over to a "main tab" (denoted by a purple arrow). All of your active dragons are displayed, sorted into tab pages, identical to how the legacy lair displayed them, i.e. 20 dragons per page. You will easily be able to see where page breaks are as you scroll to view your dragons. While your lair looks different, no changes have been made to your lair's dragon order. It's the same as it was before the lair revamp was launched. By default, new dragons that you acquire through gameplay (Auction House, Crossroads, hatched eggs, etc.) will be sent to the last page of the main tab (internally, we’ve been calling the main tab the "dragon inbox"). This tab will always be flagged with a purple arrow icon so you can find your newest dragons. In addition to the main tab, all accounts have been given one additional tab for free! This means you can start organizing right away without any investment. If you don’t want to use the tab, leave it empty and it won’t display (to you or others) on your lair when you leave Edit Mode. You can purchase additional lair tabs (up to a total of 15 in all) for treasure. You also have the option to rename any of the tabs (including the main tab) at any time for no cost, and arrange them in whatever order you wish. Taking our example above, you could name the main tab "Dragon Inbox", move it to the rightmost spot on your tab layout, and have its only purpose be to handle incoming dragons. Additionally, we’ve dedicated time to ensure the act of arranging your dragons is much easier on mobile devices. Edit Mode was built to recognize your device type. Moving dragons (whether its with a mouse cursor or your fingers) feels as natural as possible. We also removed a few tooltips from the mobile version so that it's not necessary to click certain buttons more than once just to perform one action. Gone are the days where moving a dragon from page 1 to page 9 was a multi-step process; you can drag that dragon all the way to the bottom of Edit Mode into its new page with one action! You can even collapse pages you don’t want to move the dragon into, making it far easier to avoid mistakes and resulting in far less scrolling overall. It is also now possible for you to select multiple dragons at once and either send them to a different tab or into the Hibernal Den! Dragons Per Page Increased: In the legacy system, the number of dragons per page was a minimum/maximum of 20. 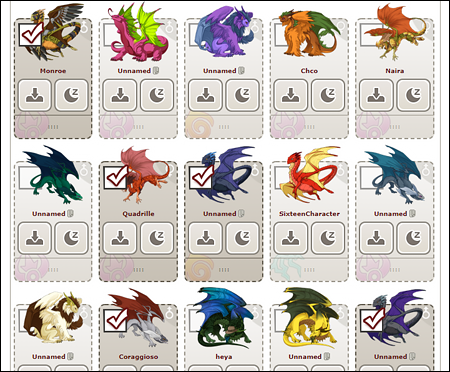 All accounts have been migrated to the new system with their dragons preserved in this format. We have increased the maximum number of visible dragons per page to 60. This means that if you want to showcase more than 20 dragons on a particular page of the tab you’re working in, you can! What you design within Edit Mode is what other players will see. Dragons Per Row: Based on player feedback, you are now able to set whether or not to display 4 or 5 dragons per row. This visual setting can be applied at the tab level. Tab Icons: If you’d like to customize your dragon lair just a little more, you can also designate an icon for each of your tabs. We have a fairly robust set to start with, and we hope to add more icons over time. We’ve also moved lair expansion information and functions to the top of Edit Mode, rather than at the bottom of the last page of your lair. This will allow you to quickly see, at a glance, how many dragons you currently have, and how many your lair can support. You can easily expand your lair slots and tabs with the click or tap of a button. That’s not all, though! It's also possible to highlight dragons that meet certain criteria if you’re looking for a specific dragon! Selecting a highlight filter will set all other dragons in the lair to a lower opacity, leaving only the ones who meet specific parameters in plain sight. This filtering system can also be toggled on when viewing your lair outside Edit Mode by clicking the magnifying glass button before your first tab. The Hibernal Den acts as an optional secondary cosmetic storage area for dragons that you love and want to keep around, but don’t necessarily want to interact with the rest of the game’s features and functions. You can jump directly to your Hibernal Den by clicking the following button at the top of your dragon lair. if they are tending a nest. if they are listed on the Auction House. if they are part of your active Coliseum team. if they are attached to a pending Crossroads trade. if they have a Hibernation Cooldown. lose energy or be fed. be traded via Crossroads or sold via the Auction House. be put on a Coliseum team. be modified by certain specialty items like breed or gene scrolls. When a dragon is removed from the Hibernal Den, it will receive a "hibernation cooldown" of 30 days. It cannot be placed in a Hibernal Den (be it yours or another player's) again until this duration expires. There will need to be an empty slot for them in the lair. Hibernal Den also has an Edit Mode, complete with tabs and pages, and you can perform most of the same functions within. There are a few differences. All players start with one (1) free Hibernal Den tab (their "main" tab), and five (5) free Hibernal Den slots (each slot accommodating one dragon). 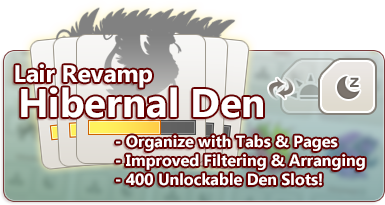 Item Turn-In Tasks: You will be able to unlock 300 total Hibernal Den slots by completing item turn-in tasks. These tasks begin fairly easy and increase in difficulty the further you go, but all items can be obtained through Flight Rising's various features like Gathering, Marketplace, and the Coliseum. Gems: You will be able to unlock 100 total Hibernal Den slots by purchasing them with gems ( 50 each). If you unlock all slots in the Hibernal Den and fully expand your Lair, that's space for a total of 605 dragons! A note: The lair revamp’s focus was to improve usability and address player feedback on how the lair works. Revamping the infrastructure for how dragons are organized allowed us to create a foundation for potential improvements, updates, and customization options in the future. Adding additional dragon storage slots to the lair was not a part of this project’s goal. We understand this won't be viewed as a popular decision for some of you, and that you may be feeling discouraged. We also understand that it seems like it would be easy to just tack more lair space on at the same time we deploy the revamp, but to put it simply: it’s not. Adding additional lair space affects small and large lairs in non-uniform ways due to how the energy/hunger mechanic works. We need to allow the addition of the Hibernal Den to have time to breathe before we revisit that discussion internally. So while we don’t have any current plans for additional regular lair space, we are monitoring how the Hibernal Den complements current gameplay styles. We encourage everyone to spend some time with the added capacity for awhile and provide us feedback once things have settled a bit more. Thank you to everyone who provided feedback in the Suggestions forum and developer updates over the years, as those discussions helped shape how this revamp came together in the way that it did. We look forward to seeing all the new and creative ways you'll showcase your dragons! Thank you for hanging in there with the long maintenance! We've topped off all of your dragons' energy for you. Going forward, if you want a dragon to be at full energy while hibernating, you need to feed them before you send them to the den. If you pull the dragon out to feed it, it will have the hibernation cooldown for 30 days and it can't be removed, not even by Support. And there's new emojis. Very important. [quote name="Undel" date="2019-02-07 10:53:51" ] And there's new emojis. Very important. [center][emoji=left wing][emoji=guardian angry][emoji=guardian confused][emoji=guardian deadpan][emoji=guardian happy][emoji=guardian laughing][emoji=guardian love][emoji=guardian sad][emoji=guardian scared][emoji=guardian sleepy][emoji=guardian star][emoji=guardian tongue][emoji=guardian winking][emoji=right wing][/center] [/quote] Important x infinity. [emoji=left wing][emoji=owl][emoji=right wing] - Amaze! I'm gonna go take a nap. Wake me up in like 45 min. Edit Edit: I realized that I was the first one after the staff to post! Which is a first for me! Wonderful! Playing around with this I really like it. It's intuitive to use and looks really nice.